One of the benefits of homeschooling that I really enjoy is the freedom to create lessons that go beyond the textbook page. Since our school days are not bound by rigid time constraints, we can explore topics in various creative ways. One way that has proven to form lasting memories for my children is the use of food. There are multiple ways to incorporate food into your lessons. Exploring different recipes as they apply to the study of history is one example. My kids still remember the sunflower seed cakes we made when we were studying Native American history. Their young palettes did not appreciate this dish. Then there was the apple stack cake that they created when we were studying the 1800’s. It was a big hit in our home and we made the recipe multiple times. There are many resources readily available that suggest recipes that relate to specific time periods. Exploring these foods helps kids get a sense for what life was like then. Although many recipes have been modified to suit current cooking practices, you can attempt to duplicate how the recipes were originally made by researching the cooking methods appropriate to the time period. You can also explore recipes as they relate to different cultures and geographic locations. In addition to history and geography, food can be used in other subject areas. For science, you can make candy, butter, or ice cream in the study of chemical reactions. For math, you can use pieces of candy when learning to count or when learning addition and subtraction. The act of measuring ingredients can be used to teach fractions, especially if you are halving or doubling a recipe. There really is no limit to the number of ways that you can use food in your lessons. Using food in your lessons does not come without costs or risks. You will probably have to spend money on the food and it will cost some of your time. There is the risk that your children will not like the food, as was the case with our sunflower seed cakes. There is also the risk that something goes wrong with a recipe, as was the case when my kids made ice cream. However, the point of using food in your lessons is not to create great food. Sure, it’s wonderful if the recipe is a success and the dish tastes delicious. But, the point of using food is to create meaningful and memorable experiences. I would argue that the failures provide even more opportunities for learning and discussion than the successes. Plus, you can always try again. There’s just something about the sensory experience of tasting foods while learning about a topic that creates a lasting memory. Sure, it takes more planning and preparation than just opening a book or printing a worksheet, but I think it’s worth it. 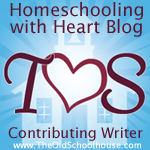 When your children reflect back on their homeschool days, what do you want them to remember? I want my kids to remember the fun times we had when we moved beyond the required curriculum to experience something new.